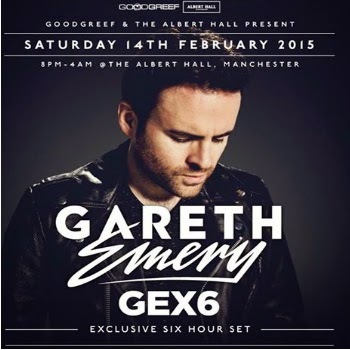 Now I’m not usually into trance and EDM as such so seeing Gareth Emery in Manchester was going to be a bit of an education for this drum and bass loving lady, but I went to the Albert Hall with an open mind. We’d heard earlier on that everything was being moved into the main room, so I was looking forward to a more intimate gig, filled with trance and no doubt, lots of epic visuals and lasers. It was an early start to the gig, with Craig Connelly stepping up at 9pm to open the night and get the crowd going, which he did extremely well. He’s only been in the game 4 or 5 years, but the guy behind the decks seemed so comfortable playing to the crowd and getting them hyped, you’d think he’d been doing it a lot longer. Then at 10pm it was time for the main man himself to take to the stage. His opening was dramatic and had a superb light show – exactly what I’d been told to expect from other fans at the gig. What I really loved (and had forgotten about trance) is how good the build ups are. You get a proper tingly feeling when a tune is coming in and there’s just something really satisfying about the dirty thumping beats you hear. We’d been promised a journey through trance and EDM – a mixture of tracks from his Garuda days as well as a sprinkling of the newer EDM style that is so popular these days. I was sold as soon as he dropped Knife Party’s Begin Again in the middle of his set, as well as the incredible moment when he played Adagio for Strings – lasers, lights, crazy visuals and confetti cannons. Everything was so on point and the crowd ate it all up. Just to mix things up he also dropped Pompeii by Bastille which threw everyone for a second but they all sang along. The vibes were amazing! The crowd itself was a major highlight – I don’t think I’ve been to any gig where the crowd were as friendly as they were at this. Not being a huge trance fan, I was unsure how the night was going to go, but Gareth Emery is so damn talented and can read the crowd so well that it was a pure delight to listen to him play. He was obviously having a great time too – he kept waving and singing along with the crowd as well as dancing whilst he was mixing. The crowd were genuinely gutted when he finished his set, but quickly got over that when Alex M.O.R.P.H and Jorn Van Deynhoven jumped on the decks and kept the crowd moving. Having never experience a trance B2B set, I was truly spoiled by their talent, which was swiftly followed by Indecent Noise going B2B with James Dymond. It was great night for me – I’m always hunting for new DJs and producers to listen to, and I went home afterwards with a list of recommendations from fans in the crowd. The Albert Hall was a great venue for it; a giant disco ball hanging from the roof meant the light show was truly epic, and the visuals all the DJs had were dead trippy! I had a really good time and it’s been a while since I went on a night out not knowing any of the acts playing. I’d definitely recommend seeing any of these guys again!